The St. Augustine Alligator Farm Zoological Park’s Wild Bird Rookery presents a unique opportunity for photographers to capture intimate images of nesting Florida wading birds. Roseate spoonbills, wood storks, great egrets, snowy egrets, and several heron species swoop in each year to raise their young in the trees within our two-acre Native Swamp and Rookery exhibit. The wooden walkway through this natural wetlands exhibit provides up-close viewing of the undisturbed birds. Adult birds displaying brilliant breeding plumage and downy chicks popping curious heads just above the walls of their nest grant amateur and professional photographers with world-class photo sessions. Our Annual Photo Contest awards the top images taken in the rookery and of our exotic animals found throughout the zoo. 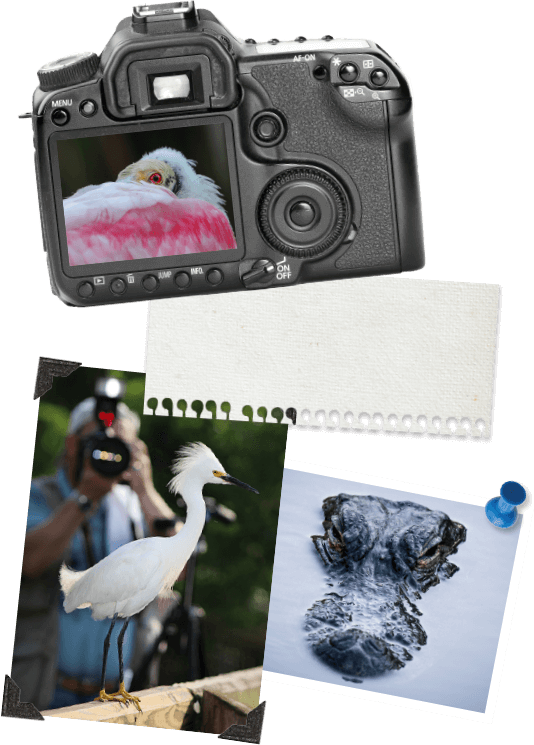 Don’t miss the chance to have your work judged by a professional nature photographer, and to snap the photo of a lifetime at the St. Augustine Alligator Farm! Our Annual Photo Contest awards the top images taken in the rookery and of our exotic animals found throughout the zoo! Click here to view the winning photography from our 2018 Photo Contest winners!